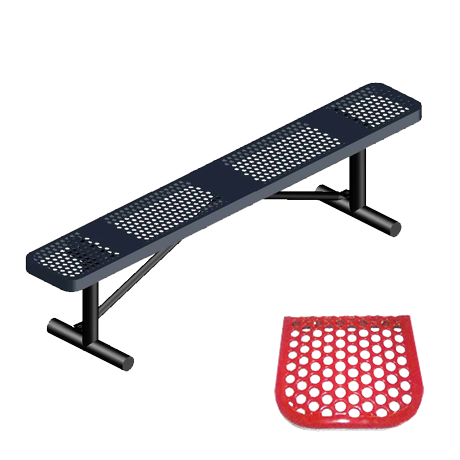 [XPB-X2PGL-VP-X] Our portable vinyl plastic coated benches are 2 3/8 inch O.D. galvanized tube with 1 1/16 inch cross brace and portable leg style to allow for mobility. To guard against up ending or tipping, end overhang is only 6 inch. These benches are perfect for indoor or outdoor use. Great for parks, locker rooms, ball diamonds, soccer fields, etc. These benches are only available with 2 x 10 inch plank seats, 6, 8, 15 ft. long. 15 ft. benches have 3 legs. For shipping quotes, orders or questions please call our Customer Service Center at 1-877-483-9270.